The materials were developed as part of a series of train-the trainer webinars on the topic of Working from Home. By educating career professionals and giving them ready-made tools, they are empowered to work confidently with their clients, opening up new options for employment for a number of traditionally underserved client groups including people with disabilities, rural communities, Aboriginal communities, newcomers, caregivers and older workers. Build your skills, knowledge and confidence related to legitimate opportunities to work from home so that you can share this knowledge with your clients. 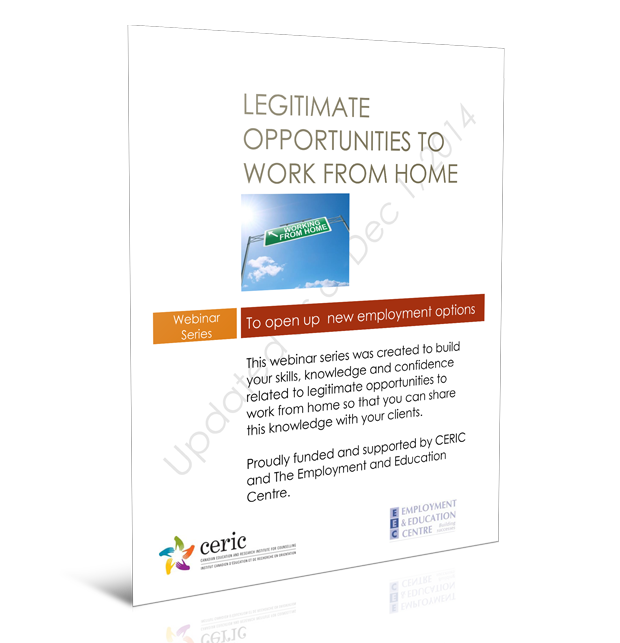 Featuring 70 validated work-from-home opportunities, from telephone-based work to virtual assistants to translation, e-learning and gaming.